Since I’ve become a raw milk convert I finally have a source of true sour milk to use in old recipes. What was left of the most recent gallon of raw milk that I had just went sour. Even though sour raw milk is still perfectly safe to drink, the sour taste and smell isn’t exactly very appealing, not to me anyways. Maybe it’s an acquired taste. For now, though, I definitely prefer the sweet flavor of fresh raw milk. What to do with Raw Milk that’s Gone Sour? Even though I don’t care to drink raw milk that has gone sour, it’s perfect for using in baking. That’s one of the many benefits of raw milk – when it sours, it’s still perfectly useful unlike pasteurized milk which needs to be poured down the drain once it’s spoiled. It’s pretty rare to find a recipe that uses sour milk in any modern cookbook, unless it’s Nourishing Traditions of course. If you look in any cookbook or recipe pamphlet from the 1800s or earlier, though, you’ll most likely find several recipes that call for sour milk. Sour milk was much more common in the days before pasteurized milk became the norm and in the days before refrigeration when milk soured much more quickly, especially in the summertime. I’ve tried a couple of unsuccessful sour milk recipes in the past few months since I started drinking raw milk. They weren’t failures because of the sour milk itself but because of my own misinterpretations of the 19th century recipes. 19th century recipes aren’t very hard to mess up because they usually give very little in the way of actual instructions for how to use the ingredients. I guess back then it was assumed that anyone using the recipes would know what to do with the ingredients. So, because I’ve had a few sour milk baking failures, I was pretty excited when I found a recipe that actually worked! ~ taken from Mrs. Winslow’s Domestic Receipt Book for 1869. Directions: Preheat oven to 350 degrees and grease and flour a 13 x 9 inch baking pan. For the best results and a lighter cake, let the eggs and milk sit out on the counter until they reach room temperature before using them. Melt the butter and pour it into your mixing bowl. Then add the brown sugar, the molasses, and the ginger and stir until combined. Beat the eggs lightly and add them to the mixture, stirring again until combined. Dissolve the baking soda into the cup of sour milk. Once the baking soda is fully dissolved, add the milk to the batter and stir again. Add the three cups of flour and stir until all of the ingredients are fully incorporated. Pour the batter into the pan and bake at 350 degrees for 30 minutes or until a toothpick inserted in the center comes out clean. Optional: I drizzled a bit of icing over my cake because it looks so much prettier that way and because icing lets you feel like you’re being indulgent without the complete sugar-high that comes with a true frosting. I didn’t actually measure out the ingredients I used for the icing, but basically I just put a little powdered sugar in a bowl, added about a teaspoonful of maple syrup, a few drops of pure lemon extract, and a little bit of pure vanilla extract (probably about a 1/2 teaspoon.) Then I just added a few drops of water and stirred and added a few more drops and stirred again until it was the right consistency for drizzling. Recipe Analysis: This cake is surprisingly light for a cake made entirely from whole wheat flour. Most whole wheat flour cakes end up being pretty dry and heavy, but this cake has a very nice texture. Maybe it’s the sour milk that makes the difference? Whatever it is, I was pleasantly surprised by the texture. The flavor is great too – sweet without being sickeningly sweet and subtly gingery without being overpowering. In fact, the next time I make this, I might even add a bit more ginger because I like my gingerbread to be sufficiently spicy. This cake would be great for experimenting with different spice combinations too – cinnamon, nutmeg, allspice, mace, cloves – I think any and all of those would be delicious with this cake. If you don’t have raw milk that’s already sour, you can just leave your raw milk out on the counter until it sours. Or, if you only have regular pasteurized milk available, you can add a spoonful of vinegar to the milk. I decided to substitute molasses for some of the brown sugar in the recipe since molasses is less of a processed and refined food than regular sugar is. A half cup of refined sugar is better than a whole cup. If you’re feeling adventurous, though, you could experiment with using all molasses and no brown sugar. When I’ve done this in the past, the end result has been kind of sticky, but there might be a way to play around with the ingredients to keep that from happening. For now, though, I’m content with just reducing the refined sugar. Everything in moderation anyways, right? 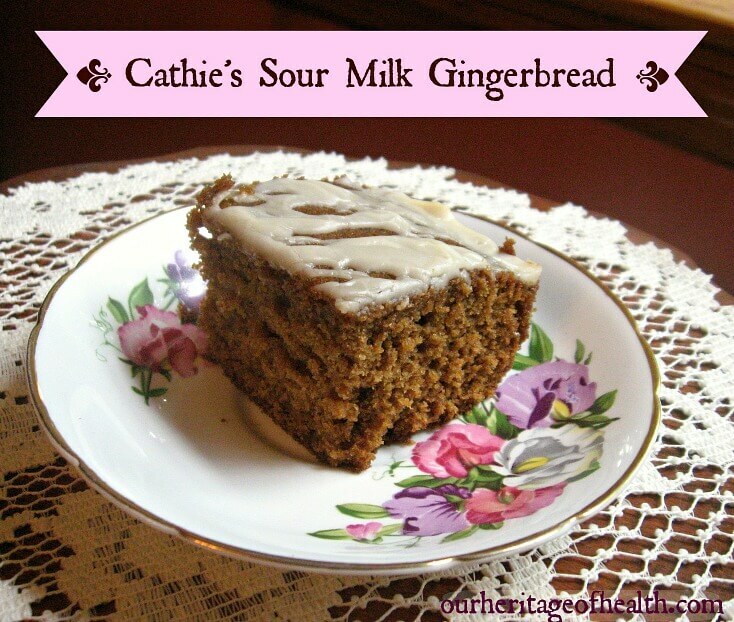 Well, it might not be the Christmas season quite yet, but I’m ready for some good old-fashioned sour milk gingerbread! I think I’ll go have another piece right now . . . This post is linked to Make Your Move Monday at Simply Made Home, Scratch Cookin’ Tuesday at Granny’s Vital Vittles, Hearth and Soul at Elsa Cooks, and Food on Friday at Carole’s Chatter. I love these old recipes! Thanks for sharing it with us at Scratch Cookin’ Tuesday! I’ve haven’t tried it with coconut sugar, but I bet it would be delicious! I recently found a source for organic whole cane sugar, so I’ve been using that in place of brown sugar since the whole cane sugar is less refined. 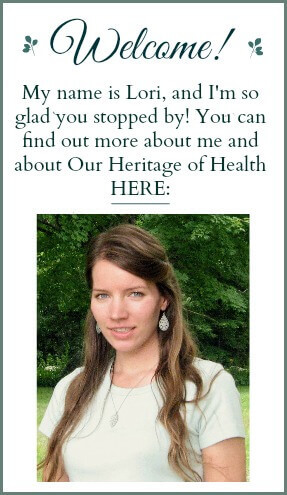 Hi, Carole, thanks for letting me know about the link-up! I’m on my way over there now 🙂 And happy New Year to you too! Lori, thank you for linking this in to Food on Friday. We are now getting a great collection of dishes using ginger together. I hope you have stopped by some of the other links to check them out!